This is plate 11 of HH Wilson's 'The Oriental Portfolio'. 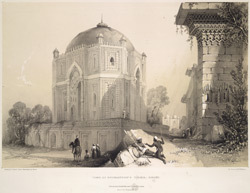 Describing the plate, Wilson wrote: "The edifice of which a representation is here given, in one of the numerous handsome mausolea, observable in the vicinity of Dehli ... The building in question is said by the natives of Delhi to be the tomb of one of the ministers of the Emperor Hoomayoon-Tardi Beg Khan. He was Governor of Delhi at the date of Hoomayoon's death, AD 1556. Although Hoomayoon had regained the sovereignty of which Shir Shah had deprived him; he had not annihilated the power of Sher Shah's descendants; and one of them, Mohammed Shah Adil, disputed with Akbar the dominions of the Mogul ... The tomb stands about a quarter of a mile west of that of Hoomayoon. It is built chiefly of brick, but is faced with sandstone, and ornamented with white marble mouldings. The interior is coated with chunam of a coarser than usual description. The edifice is of a single style of architecture than is common in similar buildings, especially in those of a later era."